The Fanjingshan mafic-ultramafic rocks in the west Jiangnan Orogen of South China are considered to be a potential target for mineral exploration. However, the petrogenesis and magma evolution of these rocks are not yet clearly constrained, let along their economic significance. 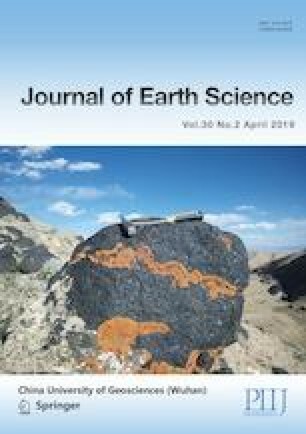 The compositions of platinum group elements (PGE) in the Fanjingshan mafic-ultramafic rocks can provide particular insight into the generation and evolution of the mantle-derived magma and thus the potential of Cu-Ni-PGE sulphide mineralization. The Fanjingshan mafic-ultramafic rocks have relatively high Pd-subgroup PGE (PPGE) relative to Ir-subgroup PGE (IPGE) in the primitive mantle-normalized diagrams. Meanwhile, the Fanjingshan mafic-ultramafic rocks have low Pd/Ir (11–28) ratios, implying relatively low degree of partial melting in the mantle. Low Cu/Pd ratios (545–5 216) and high Cu/Zr ratios (0.4–5.8 with the majority greater than 1) of Fanjingshan ultramafic rocks indicate that the S-undersaturated parental magma with relatively high PGE was formed. Although the Fanjingshan mafic rocks have remarkably higher Cu/Pd ratios (8 913–107 016) likely resulting from sulphide segregation, the degree of sulphide removal is insignificant. Fractionation of olivine rather than chromite and platinum group minerals or alloys governed the fractionation of PGE and produced depletion of IPGE (Os, Ir and Ru) relative to PPGE (Rh, Pt and Pd), as supported by the positive correlation between Pd/Ir and V, Y and REE. Collectively, original S-undersaturated magma and insignificant crustal contamination during magma ascent and emplacement result in the separation of immiscible sulphide impossible and thus impede the formation of economic Cu-Ni-PGE sulphide mineralization within the Fanjingshan mafic-ultramafic rocks. Supplementary material is available for this article at https://doi.org/10.1007/s12583-018-1201-x and is accessible for authorized users. This study was supported by the National Natural Science Foundation of China (No. 41572170), “Thousand Youth Talents Plan” grant to Wei Wang and MOST Special Fund from the State Key Laboratory of Geological Processes and Mineral Resources (No. MSFGPMR11 and 01-1). We would like to thank Liang Qi and Xiaowen Huang for the PGE analyses. Jian-Feng Gao is thanked for discussion on an early version of this manuscript. The language is polished and improved greatly by Prof. Pandit Manoj. Two anonymous reviewers are thanked for their constructive comments. The final publication is available at Springer via https://doi.org/10.1007/s12583-018-1201-x.